AT a lonely cottage lying out on Dartmoor, a party of men halted early one summer's morning, and stood talking for some time with a woman who came to the door in answer to their knock. By their dress it was easy to see that they were warders, or some such officials, from the great convict prison only a few miles distant from the spot. They were out on one of those quests that arise every now and then—the search for an escaped prisoner—and they were questioning the woman closely. She was pale, thin, delicate-looking, scarce thirty years of age, and had evidently been good-looking; but sorrow was written in each of the many lines with which her face was marked, and the eyes, sunken and circled round with dark rings, had that wistful, pathetic look that, to those who know how to interpret its meaning, speaks all too eloquently of a heart overburdened with affliction. Yet her expression was refined and pleasing, and her face was that of one who had been gently reared, and very different from what one would have expected in the occupant of a poor cottage on that wild moor, miles away from the nearest habitation. She had, indeed, but recently come to this secluded cottage—from London, it was said, for there had been some talk about her in the little village a few miles away, to which she went now and then to buy groceries and necessaries, and to call on the Vicar, Mr. Godfrey, who seemed to know her. The party of prison officials entered the cottage and carefully searched in every nook and corner, then looked into the pigsty, and inspected several rickety sheds outside. Finally they left her and walked across the moor. At the open door the woman sat and watched them till they had gone some distance. Then there came across her face a look of anguish, and she burst into tears. "A prisoner escaped!" she sobbed out, almost in a whisper, "Great Heavens! it might be he; and, if so—should they take him again—it would be worse for him than before! I must go and see Mr. Godfrey; he may be able to advise me, in case—in case he were to come here. I will start at once." Then came another thought to her. "I can't take the child," she murmured anxiously; "and it may be another, not he; in any case he would not know that I am away. No matter who it may be, he is likely to be starving. If he comes here, and finds some food, he surely would not hurt the child." She went into another room, where a pretty, fair-haired little girl was playing with some toys. "Polly," she said tenderly, "I must go out for a while and cannot, take you. Do not be afraid if anyone should come while I am gone, No one will hurt you; God will take care of little Polly, I will be back as soon as I can. And now I want you to come and see where I put the things, that you may tell anyone who comes in, in case he should be hungry." Polly obediently left her toys and watched her mother while she made her preparation; then the latter, after putting on a thin jacket and shabby-looking hat, was soon on her way across the moor. MR. GODFREY, immersed in thought in his study, busy on his sermon for the following Sunday, was much surprised when the name of Mrs. Royston was brought in to him by his servant. "H'm! I hope nothing's wrong," he said to himself. "Show her in at once." And shortly there entered the woman from the cottage. He greeted her kindly with the words: "You usually come on Saturday, Mrs, Royston, and to-day is Friday, and you have not brought the child, I see. I hope she is not ill?" "No, sir, thank you, But, you see, I had to walk, and shall have to walk back also, I can't look for a lift on the road to-day as I can on Saturdays." "But you have something particular to tell me," returned the Vicar, eyeing her through his glasses. Then he pushed away his papers, as a sign that he was prepared to give his attention to whatever his visitor had to say. Years before, Mary Royston had been a happy young wife—for a short, a very short time. But her husband, James Royston, had somehow got upon "the down grade," had lost a good position, and, finally, in the moment of temptation, had committed forgery, for which he had been prosecuted and sentenced to penal servitude. 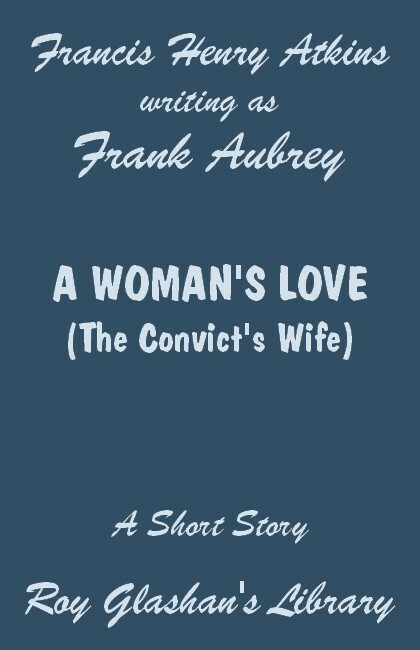 How she passed through the terrible time of the loss of her home, of the police-court examinations and the trial, she could scarcely afterwards remember; and when, on hearing the sentence of ten years' imprisonment, she fell fainting upon the floor of the court, she came, back to consciousness only to find herself lying in a hospital ward. Her sole relative in the world was her father, and him her marriage had bitterly offended and estranged. He had ever since refused to speak to her or recognise her in any way; and now, absolutely penniless, only the hospital had saved her from a lonely death-bed or the workhouse. Her child—but a few months old—she had entrusted during the period of her troubles to a poor woman she had herself befriended in happier days; and now the thought of what would become of it lay heavy upon her mind, and seemed ever with her, while she tossed, restless, weary, yet sleepless, upon her bed of sickness. It was at this time that Mr. Godfrey heard of her through the medium of a Visiting Sister. With some difficulty he traced her father, Mr. Hauston; visited him, and, after many rebuffs effected a reconciliation, but only on condition that his daughter should never visit her husband, or hold communication with him. To this the unhappy wife, for the sake of her child, agreed, and for some years the three lived quietly together. Then Mr. Hauston died, leaving the daughter what property he had—a matter of a thousand pounds or so. Free now to do as she pleased, Mary Royston resolved to sell off everything, put the proceeds into some safe and easily realisable securities, and go down to Dartmoor, to be as near as possible to the husband she still loved, while awaiting the expiration of his sentence. She knew that Mr. Godfrey had obtained a living in the neighborhood, and that therefore she could count on one kind friend in her lonely life there. But when she tried to communicate with her husband she met with a grievous disappointment. His conduct had been so bad in prison that in his case the privilege of receiving occasional letters had been withdrawn. Thus matters stood at the time of her unexpected visit to Mr. Godfrey this summer's day. The clergyman eyed his visitor gravely while waiting for her to speak. "I have heard of it. But, what then? You do not know who it is? Of course you do not. Still I understand—you are no doubt thinking of—"
"Thinking? What should I, what could I think, but of one thing? Suppose—oh, Mr. Godfrey, suppose it should be my poor, unhappy husband—suppose—we should meet! Great Heaven above! what should I do—what could I do? As I came along and revelled in the radiant sunshine, heard the humming insects, felt the free play of the breeze of the moor upon my cheeks—I thought what all these must mean to him, to one whom freedom has been unknown for so many years. Oh, Mr. Godfrey—tell me—what could I do—what could I say? Could I bid him renounce them—turn his back on them, and leave me and our child to go back to his awful life in yonder fearful place? And If I did, would he not curse me for a cold, unloving wife? Tell me, sir, oh tell me—in such terrible case what am I to do—to say? Where, oh where does my duty lie to God, and—to—my husband, the father of my child?" She sank on the chair, from which she had risen in her excitement, and buried her weeping face in her hands. Mr. Godfrey talked long and soothingly to her, and then went out for a walk to see whether he could learn the name of the man who had escaped. And, while he was away, Mary Royston passed the time in prayer, Then, when he returned—though without any news—she set out on her return journey, feeling, somehow, comforted and less unhappy. WHEN Mary Royston left the cottage on the moor she was watched, unknown to herself, by one who lay concealed but a few hundred yards away. But not till she was well out of sight in the far distance did the watcher venture to show himself. Then, from a bunch of furze bushes that seemed scarce large enough to hide a cat, the form of a man emerged, first stooping and bent, and finally rising cautiously to its full height. Some time or other the hunters had here dug out a fox, and had left an excavation large enough to take the body of a man lying down; so, by drawing the bushes closely over him, the man had managed to lie hidden where there seemed to be no possibility of cover, and yet be able to watch fairly well all that went on around him. It was easy to see by his dress that he was the escaped prisoner the search-party had been in quest of, and he looked, and was, ravenously hungry. In his heart there were black, murderous thoughts, a savage determination to stick at nothing to make good his escape. And he had sworn to himself many vicious oaths that he would never go back to his prison alive, and that, if murder should be necessary to secure his freedom, he would not hesitate to commit it. "She's gone out and left the child," he muttered. "Why on earth couldn't she have taken it with her?" He went up to the cottage, opened the door and entered. Within was the child playing with a doll on the chair, and on the table the man saw, with some surprise, that the breakfast was still spread out. There were meat and bread, in a teapot there was tea not yet cold, and he was soon busy at the first meal he had had for two days. Most of this time he had passed watching the cottage, afraid to approach while anyone was there, and hoping that its occupants would go out and leave the place untenanted. He now ate as only a famished man can eat, but every now and then he went outside and took a cautious look round in all directions. Meantime, the child took scarcely any notice of him, and certainly showed no fear. He was too much engaged at first to notice this, or to pay any attention to her, but presently, looking up suddenly, he saw her large eyes fixed wonderingly on him. "I say," she said, "aren't you hungry! You are eating fast!" He muttered something savagely under his breath, but made no direct reply. "I say," continued the girl, "wouldn't you like some sugar—and some milk—and some butter? They're up there. You can reach 'em. I can't. That's why they're put up there; to be out of my reach." The man looked to where she pointed, and, getting on a chair, reached down from a high shelf the comestibles she had spoken of. Then he went on with his meal. "Humph!" he grunted at last. "That was a good idea of yours, little 'un, I never guessed they were up there." Then he added to himself in an undertone as a thought struck him—"I wonder why she left some things out and put away the others?" "Guess she expected you were coming," said the child, who had heard the remarks. The man started and stared. "Expected me!" he exclaimed. "What nonsense are you talking? Besides—how could she know—"
"I don't know," she replied, when he broke off. "But I know she left it on purpose, so she must have expected someone, and I s'pose it must be you. An' she told me, if anyone came, not to be afraid, for he wouldn't hurt me." "I don't know so much about that," growled the man. The child shook her head again. She had heard what he said, but still showed no fear. "Mam said you wouldn't hurt me, and that God would take care of me. And I know it's true. I always believe whatever Mam says," she returned sagely. Soon the man got up, and after another look outside began to hunt hastily in all directions. He was looking for two things—money, and a suitable change of clothes or disguise. "If you are looking for the money, it is up there under the candlestick. Mam left it there for you." The man turned and stared at her more astounded than ever, Then, taking up the candlestick, he found two sovereigns and some silver. Mechanically he let it fall from his fingers, and walked slowly out of the door. Outside, after another keen glance around, he sat down on a log near at hand to think things out a little. "I like you. I'm glad you came. Are you going to stay?" And she put her little hand in his. He shivered and pushed her away. "Don't touch me, child," he said huskily. "I'm not one to be touched by you,"
"I wonder," went on the little one, disregarding his speech and the action that had accompanied it, "I wonder whether my father's at all like you? I hope he is, 'cos then I shall like him when I see him." "Don't you know your father?" the man asked. "No," returned the little one. "But he's coming to us some day, Mam says, and then we shall be all happy together; so Mam says. And who's taught me how to pray every night to God to bring him to us soon. And she says that will make him come the quicker, But look! Come with me, and I will show you where you can read all about him. Mam writes about him every night after I am in bed, only I can't read it yet." She took his hand and led him, all unresisting, and walking like one in a dream, into the house, where he remained for nearly two hours. When he came out again he was a different being, His eyes were full of tears, but in his face there shone the light of a high resolve—of a courage that could now endure all hardships till the day of his deliverance should come. And the child was in his arms, strained again and again to his breast with passionate embraces. Then he set her down and strode away. Almost cheerfully he made his way back to the prison, to the thraldom he had dared so much—and had been ready to dare more—to escape from; and there, to the astonishment of his gaolers, gave himself up submissively. WHEN Mary Royston returned she found a letter waiting for her in a handwriting she knew well, and it told her what had happened in her absence. I thought [it ran] that you had done with me for ever. Even so, I could not have complained. Believing this, I hated the whole world, and felt more like a wild beast than a man. But our child—the child you have taught to love me and to pray for my coming, instead of praying against it as I had imagined—led me to where you kept your diary, and now I know all. I know the great love you have cherished in your heart for even such an outcast as myself, and how you have, at the earliest moment that you could, come here to be near me and to wait for my release. May Heaven bless you for it, and give me strength to be worthy of it, as from this moment I shall strive to be. I dare not wait to see you, lest I should falter in the resolution that now nerves me, but I go to do what I believe would please you best, hard as it is to me. I go back to endure my punishment till the time of my release shall come. Better that—for your sake—than to be hunted through the land like the desperate criminal they all think me. There was much more—but that was the text, and long did his wife pore over it that night with mingled thankfulness and anguish. But to it all was now added hope—hope for that distant future. "Yes!" she murmured softly, "I may hope now—at last. Now that he has made this great first step I feel that I can trust him and that he will go on well!" NEXT morning she was up betimes, and this time taking little Polly with her, sought Mr. Godfrey. Silently she placed the letter in his hands. He read it, and comprehended. "Of a truth," he said, "God's blessing has rested upon your great love and patience, and He has answered your prayer of yesterday. I will go at once to the prison with this letter, and see the Governor." Thus it came about that Royston met with no punishment for his escape; and his after conduct was such that he was released some time before the full term of his sentence. Needless to say he found a loving wife and daughter waiting for him; and together they went away to a new life beyond the seas. James insists on sending the enclosed, with the request that you will forward it as a donation to the hospital that took me in when I was ill, and seemed like dying, saved my life for my child and husband, and was the means of making you our friend. He traces all our subsequent happiness to that, and, being now prosperous, he wishes to send something to show that we do not forget. If all be well, it will not be the only offering we shall make, hoping humbly we may thus assist in helping others who are to-day tasting of the cup of misery from which we drank so deeply." "Ah!" said Mr. Godfrey, wistfully, "if my loved one had only lived, she would have been, I truly, reverently believe, like this one—a noble woman! It seems a little hard that even one such as Royston should possess what has been denied to me—that help and blessing, the lifelong love of a noble woman!"